As you have probably figured by now, we are going to make a hob to cut the gears on the circumference of the worm wheel blank. The hob will turn in the lathe and the worm wheel held next to it on a turntable. Whilst this arrangement should work, in practice it is helpful to make a series of small cuts around the worm wheel blank (known as gashing) to help guide the cutter around and index properly - helping us get the desired 360 tooth count. 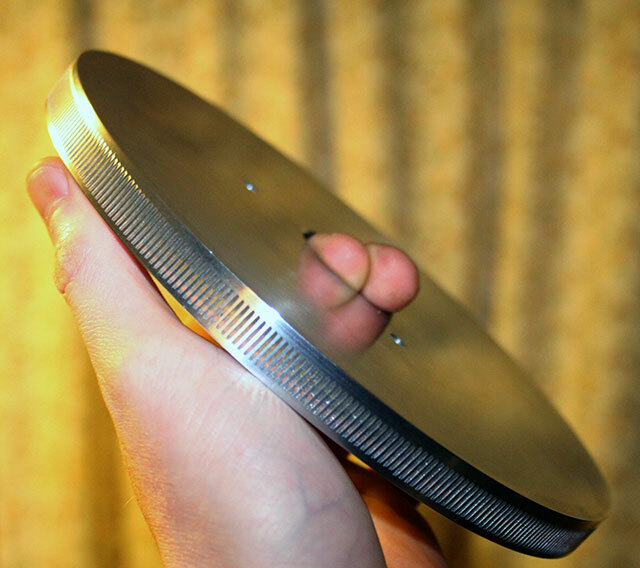 This is done by mounting the worm wheel blank on a tilted rotary table / indexer and making 360 small cuts with a slitting for a milling cutter. Needless to say this is a very dull and repetitive job which still requires concentration - I find it best to do over 3 sessions so that you do not make a mistake. Simple 60 tooth worm wheel and gear sets are cheaply available and can be converted into a diy indexer / rotary table gadget with a bit of effort. 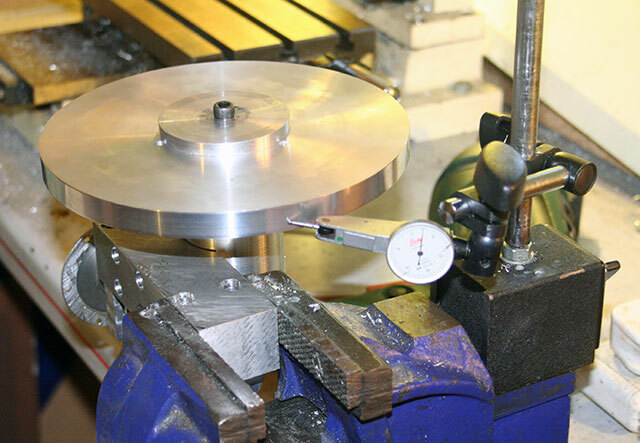 We are not doing heavy cutting, so anything that can turn the wheel blank by 1 degree at a time will do. You might wish to rig an indexer up on your lathe. Take care mounting the worm wheel blank on the indexer. Make sure that the worm wheel blank is indicated so that it is turning concentric with the axis of the index. 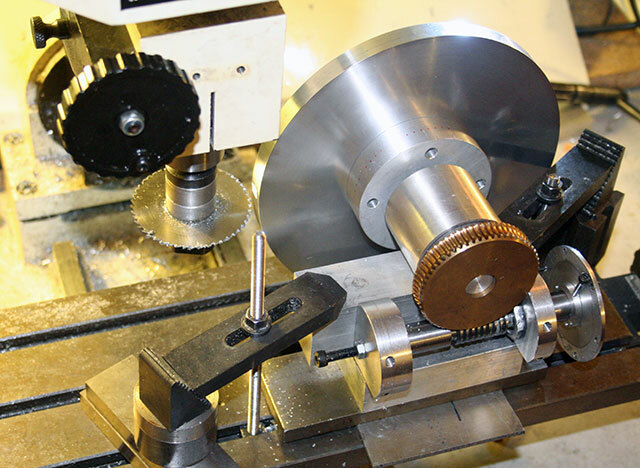 When bolted to the bed of the lathe, you must angle the wheel about 3 degrees away from the vertical. 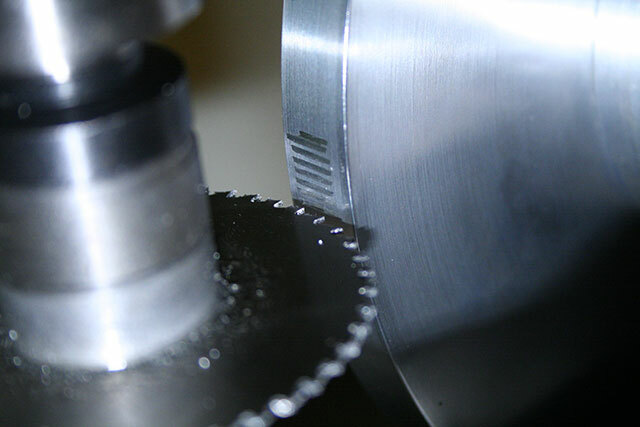 The idea is to gash some slots in the outer circumference of the worm wheel blank using a slitting saw. 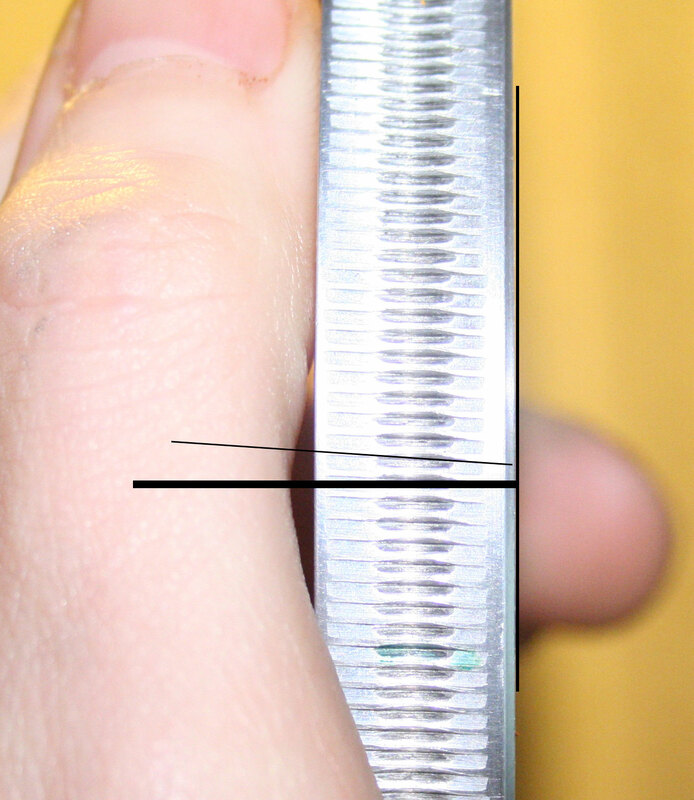 These gash marks need to be angled slightly to allow for the angle of the thread on the worm gear. Make sure you do them the correct way around. Hold the worm wheel edge on, the slots should tilt down from top left to bottom right. Make each cut about 0.25mm deep. It is important not to cut across the whole width of the edge, otherwise you will have no circumference surface to indicate on in the future. Keep advancing the indexer by one degree, move the wheel in by enough to make the cut, and then make sure you back out plenty before advancing the indexer - otherwise you will get a mess. Stick at it - it is a long hard and dull job to complete all 360 gash marks on the worm wheel blank. 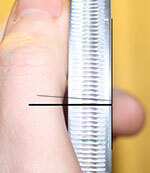 Here is an image of the fully gashed worm wheel blank.